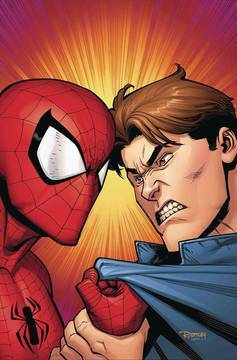 PETER PARKER VS. SPIDER-MAN?! PETER PARKER & SPIDER-MAN IN THE SAME PLACE AT THE SAME TIME?! • Things are crazy for Spider-Man. His personal life in turmoil, the giant TRI-SENTINEL returning to attack NYC… • …and someone is out there impersonating Peter Parker! • Is it the Chameleon? An LMD? Ultimate Peter Parker making his Marvel U debut? Think again, True Believer! Rated T.